One of the XLU's better-performing components in Thursday's trading was this flight-to-safety name. With Trump dominating news again, here is one course of action. There was indeed one SPDR sector ETF that closed in the green yesterday. Flight to safety? Boosted by the unexpected rally in U.S. Treasuries? That's right, the Utilities Select Sector SPDR ETF (XLU - Get Report) actually gained 0.4% on the day. The group has not done well year to date (-5.5%), but clearly the environment that provided that backdrop is not the environment we now deal with. 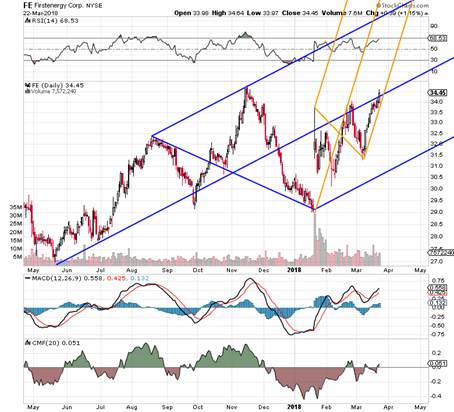 One of that ETF's better-performing components in Thursday's trade turned out to be FirstEnergy Corp. (FE - Get Report) . Great company? I don't really think so. I mean, like with many utilities, debt levels absolutely dwarf cash levels. Your Current, and Quick ratios... don't even ask. Still, for fourth-quarter 2017, profit margins expanded significantly, as has net income. The stock trades at 14 times forward-looking earnings, and the firm pays out a quarterly dividend of $0.36, or $1.44 annually for a yield of 4.18%. At the time of publication, Guilfoyle had no position in the securities mentioned.